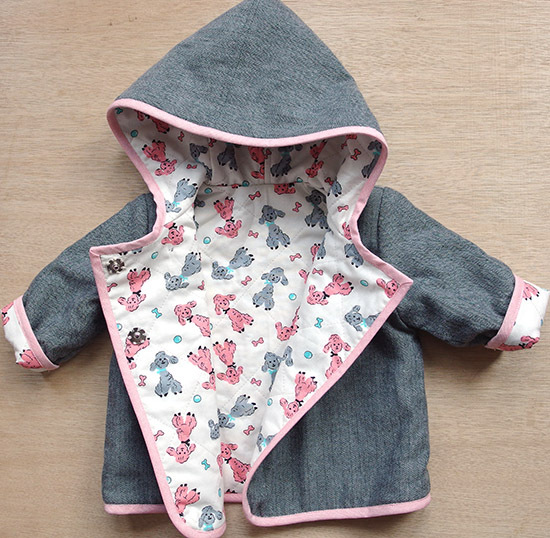 When we were browsing the Burda website after making the baby sleeping bag, we came across this lovely quilted jacket. We were attracted to this pattern as it looks like something new parents would love to receive, and it looked so cosy. It is a downloadable pattern, and cost just $5.99. The pattern covers five sizes, from age 6 months to 2 years so if you are making for a baby, you will be able to make more of these as they grow, and the seasons change. The pattern suggested using sweatshirt material for the outside, and brushed cotton for the lining, however a quick peek outside the window made us feel we wanted to make something a bit warmer. 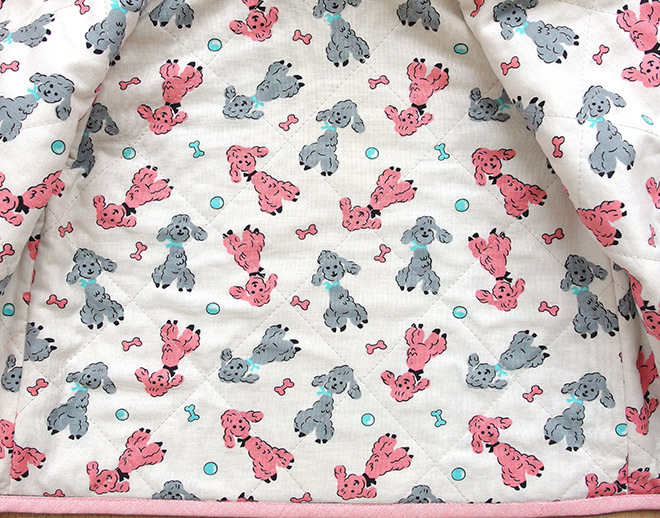 We chose a Kaufman shetland flannel for the outside, and a lovely retro poodle print for the lining. The traditional weave on the outside contrasted really well with the slightly kitsch lining – and there is nothing more lovely than a pretty lining?! Another little alteration we made was that we quilted the lining and the wadding, but did not quilt through to the front of the jacket. This flannel has more body to it that the suggested sweatshirt fabric, so felt structurally it didn’t need it, and that the herringbone didn’t need any more texture or pattern on it. Despite the way it looks, the coast was very easy to make. Once the pieces are together, the front and the hood are just finished off with binding. We used our linen effect one to add to the texture of the flannel, however this coat would also be lovely in spring made in bright colours with our gingham bias binding. We choose buttons to match the herringbone fabric, but the black on the back makes them pop. They are faux – so no buttonholes to sew, and the popper fastenings mean the coat is easy to get on and off.